With some nice calm days I was able to get outside and do the maiden flight of the Quadcopter. Flight is a very loose term for what actually occurred I had a couple of good flights, but also a couple of really decent crashes when I tried to run before learning to walk. 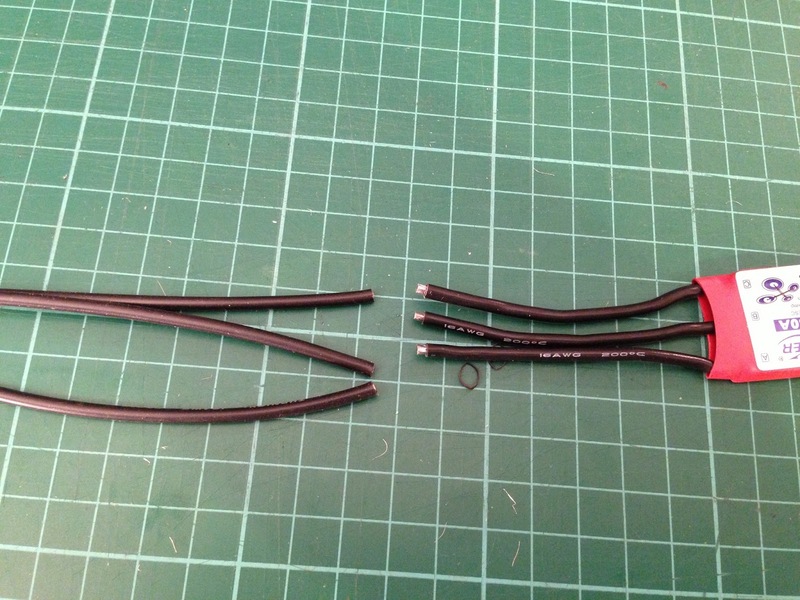 The Quad frame stood up well to the abuse, the zip ties did their job and reduced the damage. But after a while I though that I should try and save this frame for FPV and learn on a cheaper frame. So I transfered all the gear off the BlueskyRC frame to the RCtimer quad frame that came with the motors and ESC, it only took aout 30min. RCTimer frame all set, I also put the helicopter landing gear on the frame to help with "heavy" landings. Lets go over the additions and finish up of the build first. 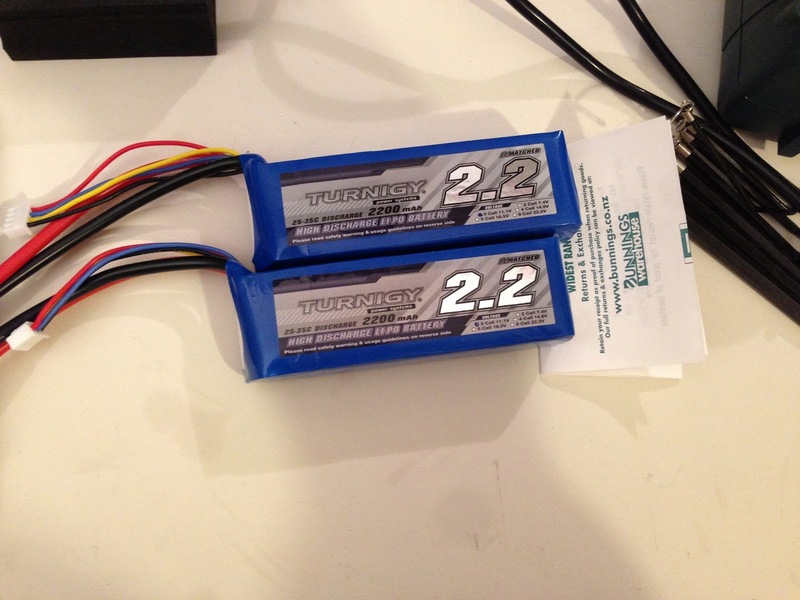 After finishing the last set of power leads required I moved on to creating a battery holder. I used popsicle stick and some thin pine wood to make this simple plate. The plate is hot glued to the bottom of the center frame. I Used hot glue so if I need to remove it I could. The plate has a gap to allow the power lead enough room. Hot glued down and velcro stuck down. It gives a nice sturdy platform and also plenty of battery postion options to get the correct CG depending on what I end up putting on the frame. 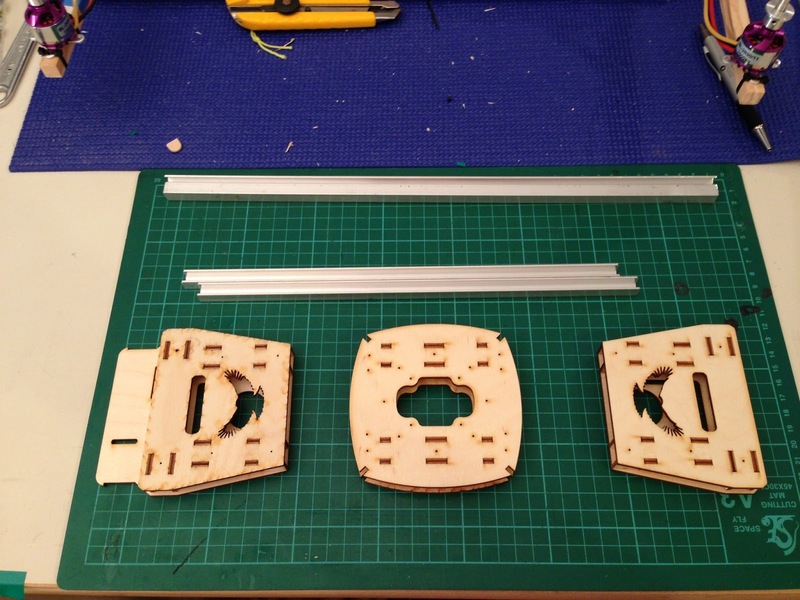 Next build item was the top plate to hold the kk2 board and the receiver. I used 4mm balsa wood for the top plate. I then needed a way of attaching the plate to the frame. 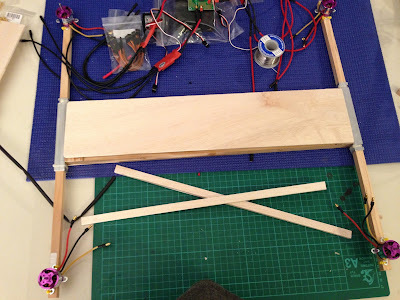 I used the trusty popsicle stick, four were cut to length and then using the already laser cut hold as reference drilled and screws to the frame. That additional advantage was that the screws used were long enough to go on to the booms so it also holds the quad together. First mount rail complete... three more to go. Top plate all glued and screwed to the frame. As you can see it give a large flat area for mount electronic. A test fit of the supplied "cage" to protect the kk2 board. Next up I mounted the kk2 board on the same foam and velcro setup used on the home made quad. The receiver was also velcroed on. All the electronics now on the Plan B build. 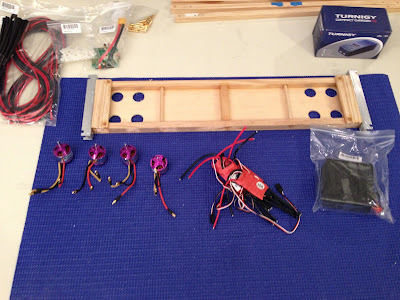 The next step was to mount the motors. I didn't use the supplied mounts, I just drill holes and used zip ties. I seems to be be very strong and rigid. It also hopefully reduced some of the weigh that I added with my modifications. I used zip ties to hold the motor booms centered. So here is the final Plan B Build.... take a final look as this may be the last time it looks like this. I will hopefully get some calm fine days soon so I can go and have a go and flying it. Wish me luck. One step forward and two back. I got the big old home made quad in the air. I rediscovered I am complete crap at flying and I had a few rough landings, All I was trying to do was some basic take off and lands, and hovering. All of which wasn't so successful. However one key learning was that the home built was BIG & Heavy for the spaces I was planning on learning to fly. I also noticed flex in the booms. So after considering my options I decided to shelf the home build for now and build on a smaller proven platform until I get my flying skills up. That meant the BlueskyRC frame was going to get use earlier than first thought. 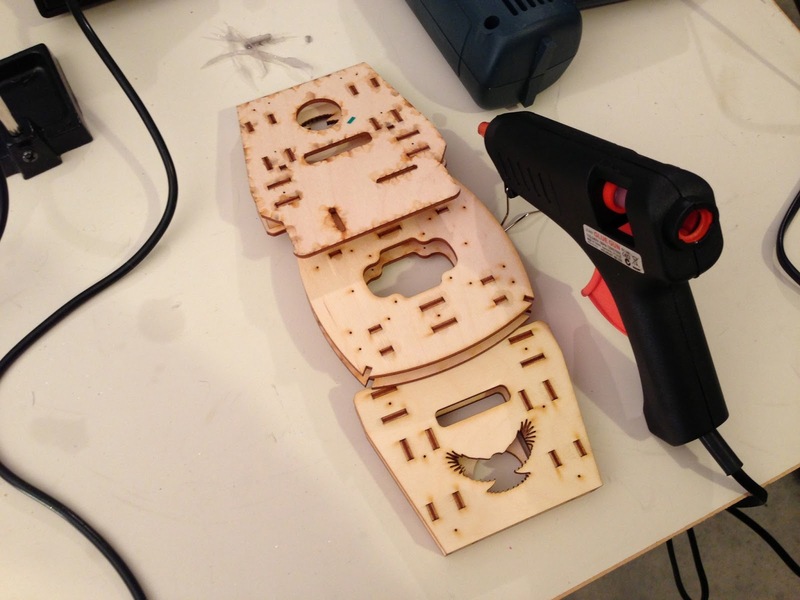 I love laser cut plywood objects and the BlueSkyRC frame is very well done. The frame snapped easily. 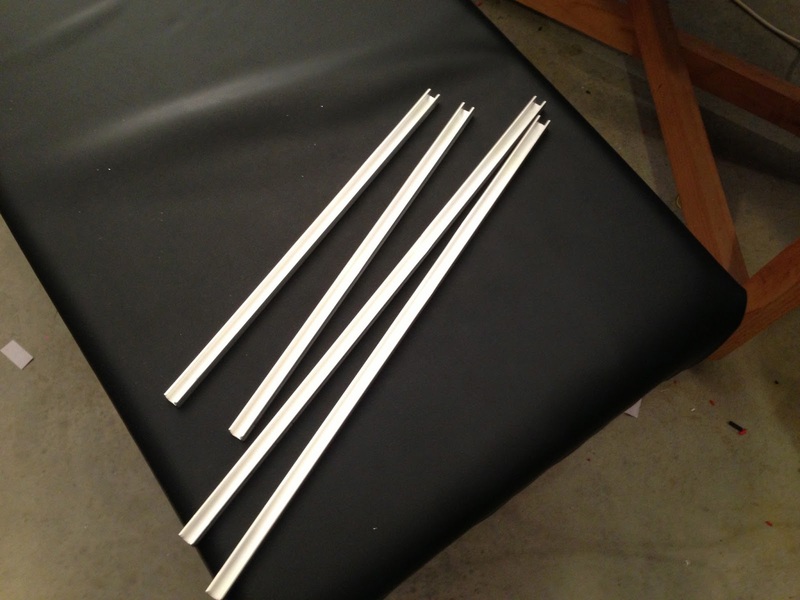 The main frame parts CA glued ready for the spars and booms. Since its really hard to get 10mm square wood rod, I am using 10mm aluminium U section. Its light and very ridge over the lengths needed. I ended up changing the measurements from standard, the booms are 400mm and the internal one are 350mm. This will allow me to have the ESC in the gaps and give a clean look. I changed to these measurements after doing some testing fittings and unfortunately had to cut another set of u section. But even at this stage it feels much ligher and more ridge than my home made one. The U Sections cut and filed to remove and sharp edges. The booms and frame parts laid out, this is the small sized one the internal ones increased in length 50mm. A quick fit together and comparison to the home built quad, yes quite a difference. 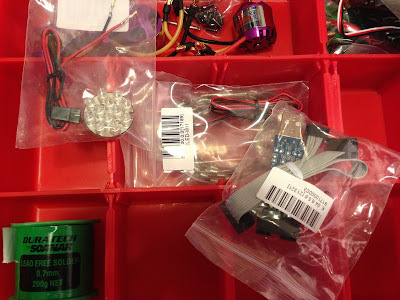 Time to take all the electronics out of the "old" quad and fit into the new one. This also included the heli0500 landing gear. Once the center was found and the middle frame section was centered the legs were zip tied in place. Already for the electronics to be included. I am a sucker for punishment, I redid the wiring on how I intended to do it the first time but wasnt able to as I was missing parts and did not want wait first time around. My aim was to make it very modula. This will allow any part of the power system to be easily replaced or used in another flying machine. 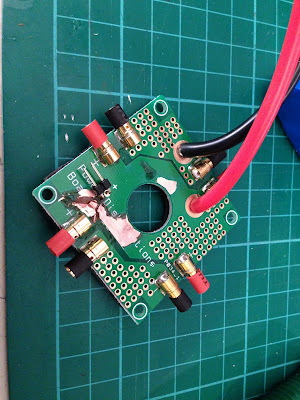 This required cutting off the leads I had soldered on the motor side of the ESC to add 3.5mm bullet connectors. That was repeated on all 4 controllers. 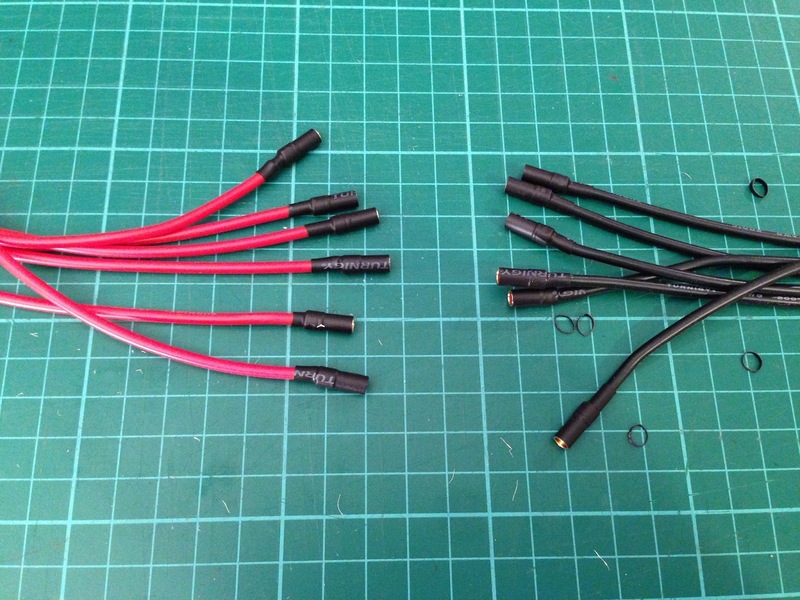 All leads were cut from the ESC leaving 20mm. 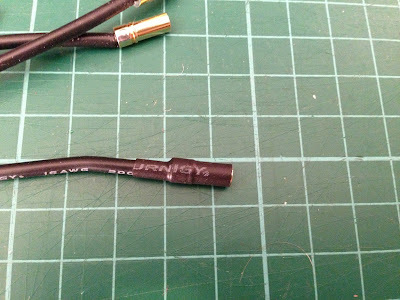 Bullet connectors were then soldered on and heat-shrink applied. All 4 ESC complete with the new bullet connectors and heat shrink. The test fit, I didn't want to just have the ESC zip tied to under carriage. I still want a nice clean look like I was getting with the home build. 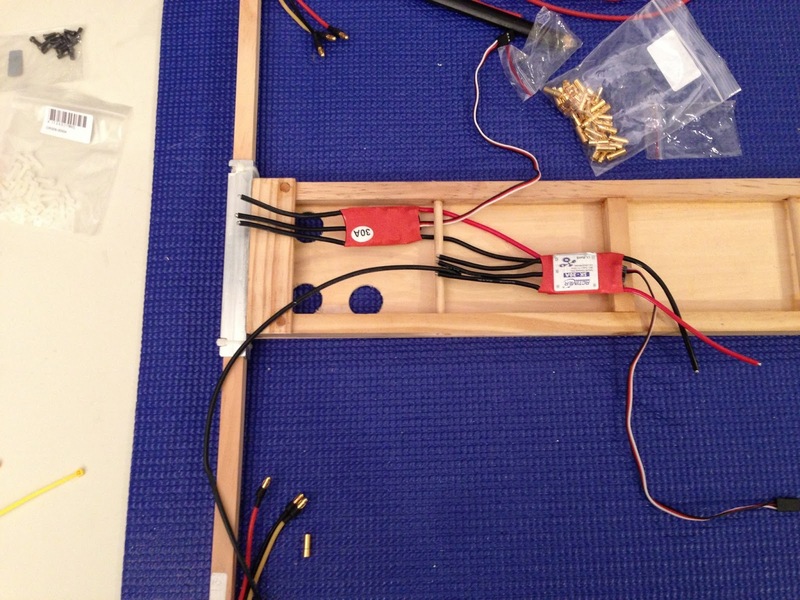 The ESC's fit snugly between the frame either side of the main frame elements. 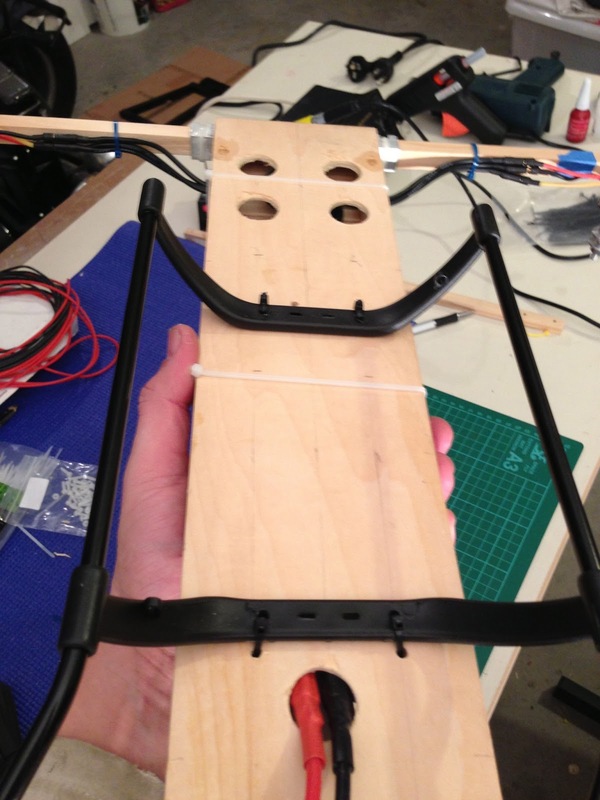 The underside will have balsa wood glued to the spars and I will make a balsa top plate to complete conceal the ESC. Yes a little OCD. 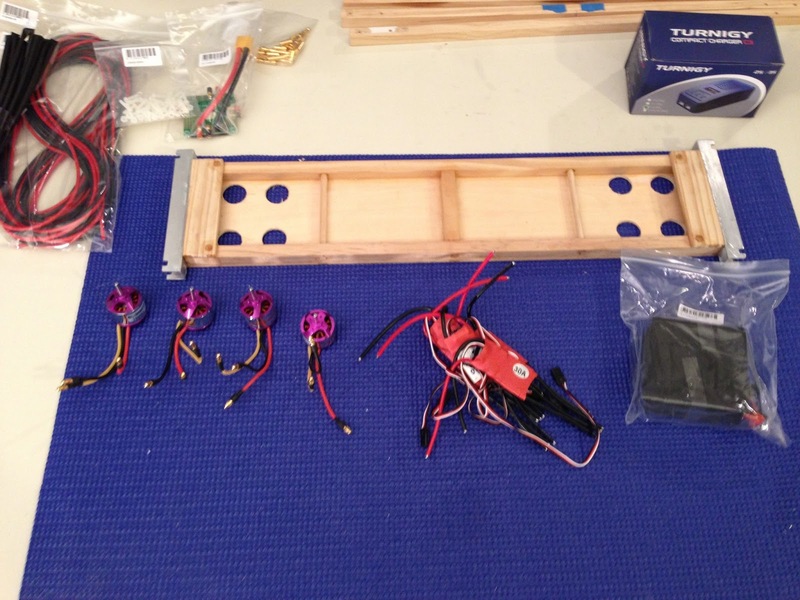 Next was to make the leads to go from the ESC to the motors that would thread through the frame. I needed 12. I reused the leads that I cut from the ESC and they were the perfect length when cut in half, got to have a bit of good luck every now and then. So a lot of soldering, I only got the first 6 done before calling it quits for the evening..... "Game of Thrones" was calling. The mess left after the evenings destroy and remake. 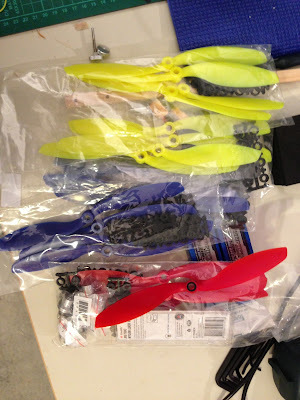 After a long wait another large box showed up from HobbyKing, It was the main one I was waiting for. 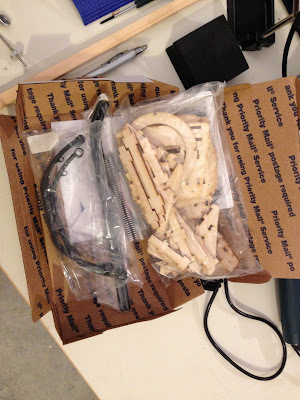 It had silicon wire, connectors, heat shrink, Transmitter, Servo leads, KK2 board and other bits to make up to the full weight for shipping. Luck would have it that it showed up on a Friday, which meant I could get stuck into it that night. During the week I purchased some organiser trays to hold all the bit that are starting to gather during the Quad build. Need to keep them separated from the other work going on in the garage. Right time to kick this next part of the build off... First task was to get a work space, very limited in the garage at the moment ... well actually always. So the portable spray table was used. I placed my old work desk top on the table (Actually just a door), worked perfectly. I then laid out the parts and tools required. I set the iPad but to capture some time lapsed footage of the evenings progress, unfortunately i forgot to full charge and only got half the build ...Doh. All the new bits laid out and getting sorted. First step mount the motors, that required the mount plates screwed on and then zip tied to the booms, I realised that I didn't have any thread-lock so only used 2 zip-ties to hold them in place until I can get some thread-lock and apply to all the mount screws. 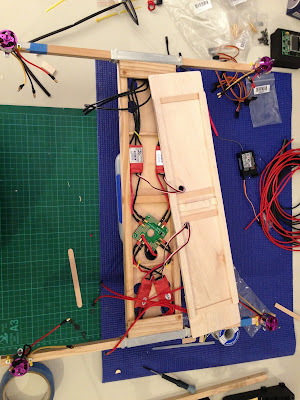 With four zip-ties holding them in-place the motors are very securely attached to the booms. I was getting a sore back working on such a low work desk ... so a little improvisation was required. I used a some speaker stands and my hotrod seat from the Ratty-T build as a seat ... work perfectly for this old man. 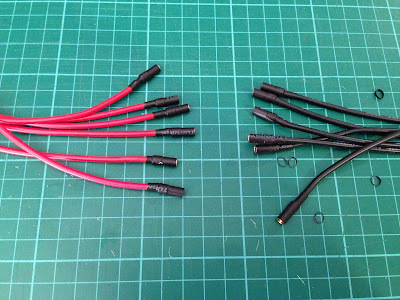 I now need to work out where the ESC were going to ne mounted and work out the wire lengths I needed. Wires cut and the end trimmed ready for pre-soldering. Using my new supa-dupa soldering iron I made quick work of soldering on the 3.5mm bullet connectors. After waiting all this time for the shipment I realised that I did not order enough ... grrr. That changed how I wanted to wire up the power harness. But I will change it one I get some more and have a few flight under my belt. One end fully complete, only 11 more to do. All wire now have 3.5 female bullet ends to connect to the motors. 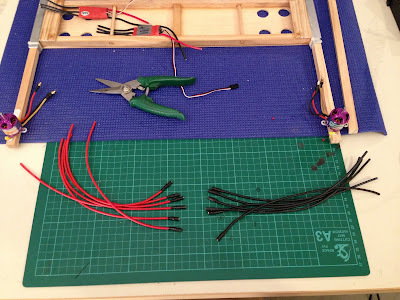 The next job was to add bullet connectors to both the ESC and the other end of the wires. 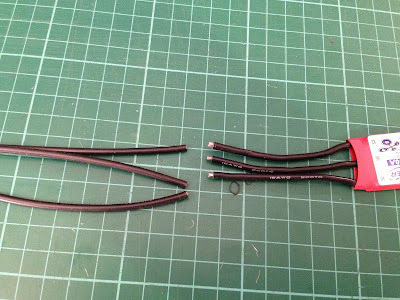 I wanted the ability tio easily remove and swap items in the quad, however since I didn't order enough I decided to splice the wires and when I get more connectors I can change that later. 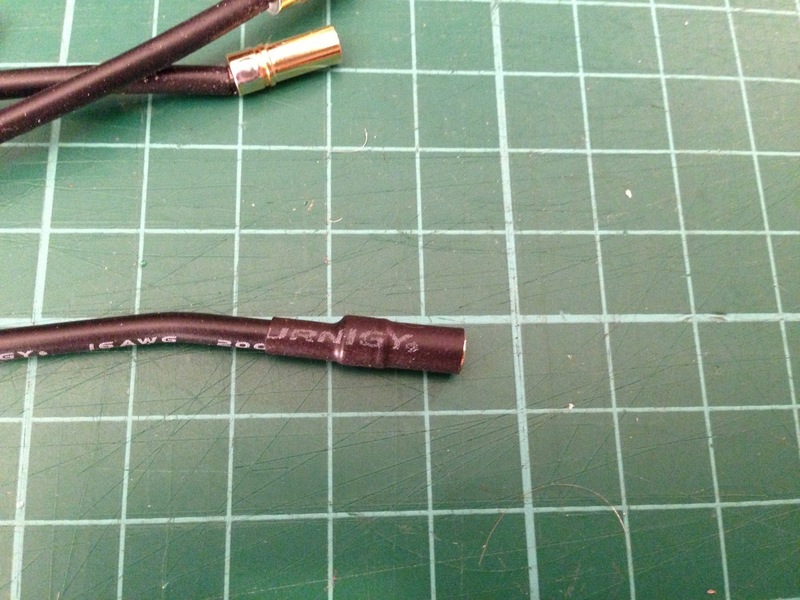 Splicing and soldering, before heat shrinking. The ESC also required connectors soldered on the power leads to connect to the power distribution board. Below is the finished power harness, and the test fitting in the frame. A quick comparison to the SM450 sized frame. 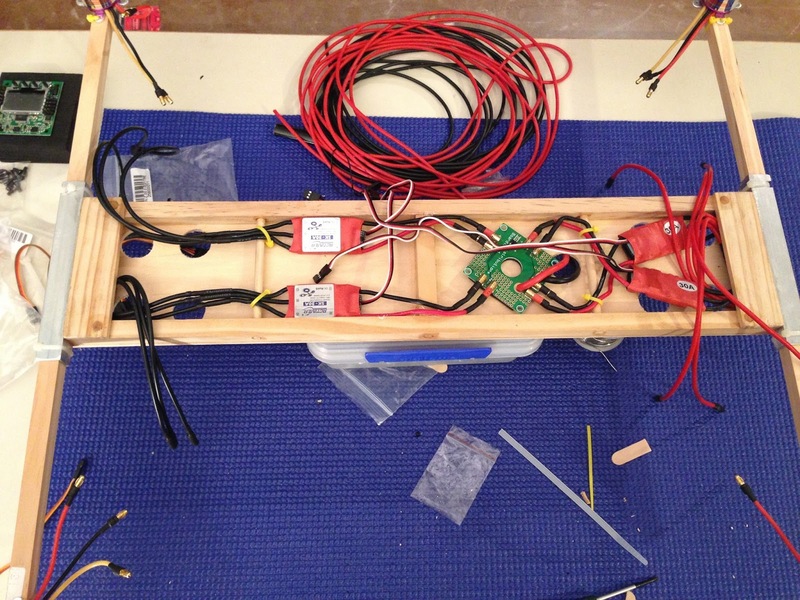 The next build task was to create plate to cover the power harness and mount the receiver and kk2 board. Using balsa wood I made two rails 12mm wide and 8mm high. I then cut the top plate out of balsa wood and covered the full length of the frame. 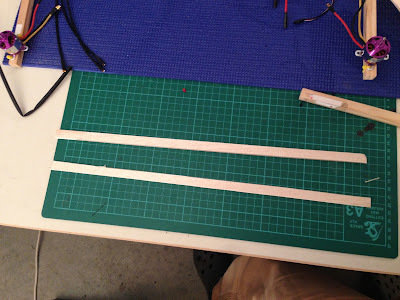 The width was correct as the frame width was based on 100mm wide ply and balsa. The rails were then CA glued to the top plate, they were shorter to allow a gap either end to allow the routing of the power harness to the motors. The top plate sitting on the frame, you can see the small gap either end to allow for the power wires. 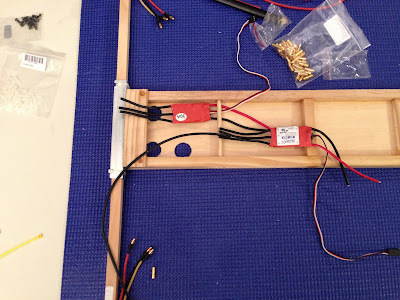 Next I zip-tied the power harness in to the frame, I then did a lot of test fits of the top plate to see where I needed to add extra strength to the balsa-wood. On the underside and center I added another rail so that rested on the frames main center cross member and cut notches to allow for the power wires that went over the top. I also added in some popsicle sticks at either end and also in the middle for where the nylon screws would be if use those to mount the KK2 board. On the top side I added popsicle stick on the edges where I planned to have zip-ties holding the top plate on. I did not want the balsa-wood crushed. A couple of holes were cut for the ESC controller leads. Getting ready to zip-tie don the top plate. One end zip-tied down and you can see the power leads out the gap and the double thin zip-ties used to hold the top plate in place. Connected up the power leads to the motors and zip-tied them in-place to give a nice tidy look. A mock up with the KK2 and receiver sitting approximately where they will be mounted. Very happy so far with the nice tidy layout and having most of the wire harness hidden. During the weekend I also got Phoenix4Rc and the TX9 playing together to do some flight simulator practice. Which only proved that Im a crap flyer and need a lot of practice. 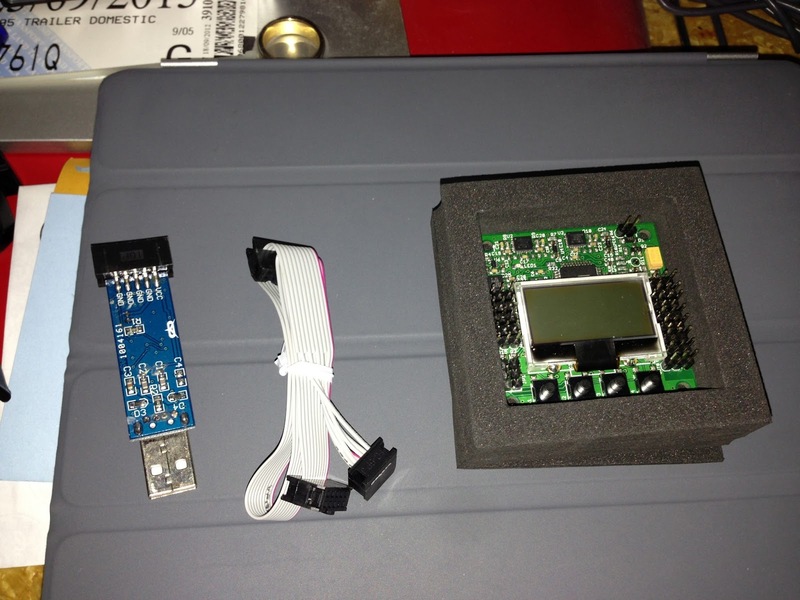 One of the other items I got from Hobbyking was the ATMEL programmer that is used to update firmware. The KK2 board was shipped with version 1.2 and the latest and recommended version is 1.5. After watching a few good youtube videos It was a simple task to up date the boards firmware to 1.5. While it was powered on it gave me a change to look at the menu structure and settings. Here is the time lapse video that didn't quite work out .. I am now waiting on other packages to arrive before the build can continue, the main one is the batteries.